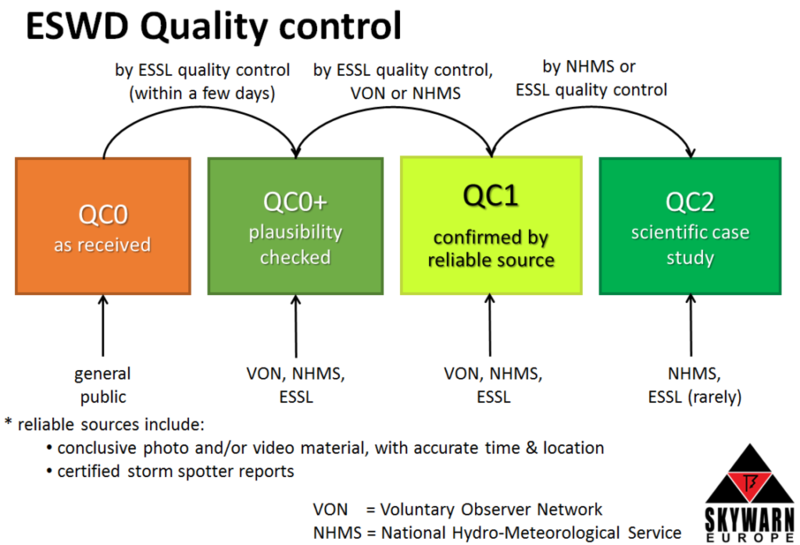 Each ESWD report is quality checked either by ESSL or one of its official partners: NHMSs (National or Regional Hydrometeorological or Meteorological Services), VONs (trusted Voluntary Observer Networks) or VOPs (trusted Voluntary Observer Persons) who concluded written agreements with ESSL. QC0 reports should only be stored in the ESWD for a very limited time (typically not much longer than one week after the report was submitted). QC0+ reports passed a basic plausibility check. Easily detectable rubbish is sorted out here. QC1 is the most important quality check level. It means that the report is confirmed by a reliable source. Reports from trusted partners will immediately receive this quality flag. QC2 means that extraordinary work has been performed to verify the validity of all pieces of information given in a certain report. This QC level is typically assigned for reports based on detailed case studies on a scientific level. Therefore QC2 is relatively rare compared to QC1. For statistical studies we suggest to take QC1 as a lower bound. For some purposes QC0+ can be used as well, if cautiously interpreted. ESSL can give advice on the best use of ESWD data and their QC levels. A PDF slide of the ESWD QC scheme can be downloaded here.